The flu virus can survive on hard surfaces for up to 48 hours, says Alison Carey, MD, an associate professor of microbiology and immunology at Drexel University. You’re surprised, right! You thought you could only catch the flu directly from another person, not so. You can also catch it from just about any hard surface. What’s the solution? Wash your hands regularly with soap and water. According to Dr. Carey, the flu viruses can survive on hard surfaces such as bus poles and counter tops and infect another person for 24 to 48 hours. Therefore, someone with the flu sneezes into their hand and then touches a doorknob, be careful. If you touch it within the next 48 hrs, there is a very good probability that you will develop the flu. Any surface can harbor a cold or flu virus long enough for someone to touch it and get sick, Dr. Carey says. However, there are certain germy hotspots like bus and subway poles and doorknobs. Basically, it’s worth being careful of any surface that gets touched again and again during the day, such as: handrails, doors, light switches, faucets, and public transportation poles. The key to avoid trouble is to maintain good hygiene. Just wash your hands, regularly and keep your hands away from your face, as much as possible. Your face is the most vulnerable part of your body when it comes to catching germs. If you’ve touched an infected surface and then bring your hand up to cover a yawn or rub your eye or scratch your nose, then you’re introducing that virus to a vulnerable spot on your body. The germs have an east entry point. All year around, but especially during the flu season, keep your hands clean. The best method is with soap and warm water. If you can’t get to that, an alcohol based sanitizer is the next best thing. And remember, when you sneeze, sneeze into a tissue or into the crook of your elbow. In addition, if you haven’t already done so, get your flu shot. 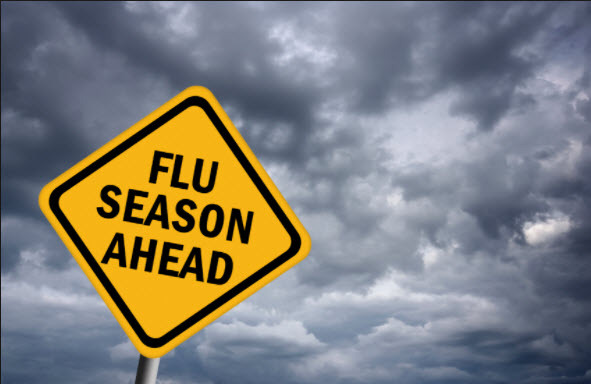 Protect yourself and your fellow citizens from potentially catching the flu from you.